Summer is coming. That means hot weather, beach time, shorts, sandals, sundresses--and lots of it. The question is, are you ready? Not to worry though, we’ve got you covered. 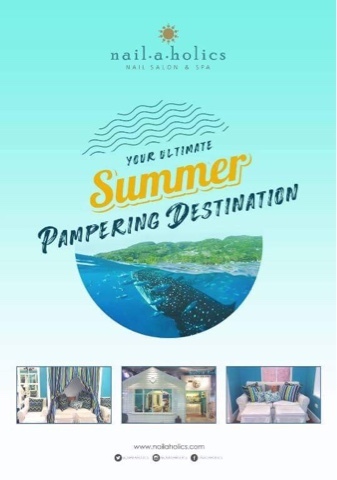 Nailaholics, the city’s top urban nail and pampering destination in the country, has been everyone’s go-to destination for the season, so here’s a run-down of things-to-do to keep your skin, tips, and toes summer ready. Over the holidays, when the wind blew colder and your legs and feet were clad in tights and boots, it was easy to miss your regular waxing and pedicure appointments. But summer means trading in your warmer outfits for colorful shorts and summer skirts, paired with your favorite flip-flops or sandals. Book an appointment for a pedicure ASAP and jumpstart the season with a waxing session to get your stems ready.